Typha latifolia is a vigorous deciduous, perennial obligate wetland species. It has upright, strap shaped leaves which are 2-4-cm in width and 1.5-3m high. It is a marginal water plant, growing in silt deposits in a depth of water of 0.75 – 1m, it prefers fresh water but will grow in slightly brackish marshes. The stems of the plant bear long flower spikes with an upper male staminate section and a lower female pistillate section, the flowers being monoecious. The flowers are borne in late summer and come in the form of dark, creamy, terminal flower heads followed by dark brown sausage shaped seed heads. The foliage is mid green in spring, summer and autumn, with brown fruits being produced during the autumn months. T.latifolia regenerates vegetatively through rhizome sprouts and sexually through seed germination. This plant prefers a sunny a site with partial shade, it will not survive in a shady location. T.latifolia, commonly known as the Bulrush, Common Bulrush, Broadleaf Cattail, Common Cattail, Great Reedmace, Cooper’s Reed and Soft Reed, is native to North and South America, Eurasia (including the UK) Africa, New Zealand, Australia, India. In Australia and Hawaii it is considered an invasive weed. It has been found in a number of climates from humid to subtropical and is able to survive at elevations from sea level up to 2,300 meters. 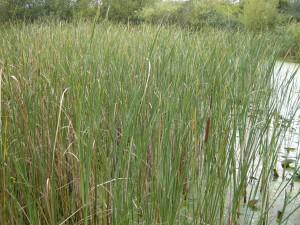 T.latifolia is often found at the edge of bodies of water mainly ponds, marshes and permanently wet drainage ditches. 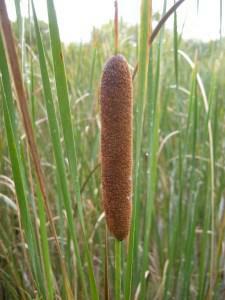 The mature flower stalks are said to resemble the tail of a cat hence the common name Cattail. Surprisingly, once established, the rhizomes of this plant will tolerate prolonged period of drought, two years have been recorded in one instance. T.latifolia is entirely edible, the Native Americans ate the newly emerged sprouts (as a green vegetable) in spring, the flower stalks (boiled) and the pollen (added to other flours). The name Typha is derived from the Greek name for this plant, ‘Tufh’.Latifolia is derived from the Latin Latus meaning ‘broad’ and folius meaning ‘leaf’ (broad leaf). The landscape architect may find this plant useful in a native wetland planting scheme. It is suitable alongside a water body such as a pond, artificial lake and slow moving rivers. It is also suitable for use as part of a Sustainable Urban Drainage Systems (SUDS) in the form of drainage ditches (swales), attenuation ponds and other suitable water features. It may also be used to treat polluted water. Ecologically this plant provides food and important nesting sites for waterfowl, marsh birds and small mammals. This plant prefers fertile muddy soils and can survive in acidic to calcareous soil pH. It prefers waterlogged soils, preferably to a depth of 0.75m to 1m. Maintenance: If a tidy appearance is required the removal of dead foliage and old flower stems may be done in spring. Due to the vigorous nature of this plant it may be necessary to have a management program in place to keep stands of this plant in check, removing unwanted plants either mechanically or by the use of herbicide (when the plant is in flower). If appropriate, this species may be managed with fire.